With December and half of January behind us, how is the NHS faring this winter? According to the British Red Cross, the service is facing a ‘humanitarian crisis’, whereas according to the Prime Minister the current situation is ‘not unusual’, with much of the media coverage perhaps closer in tone to the British Red Cross than to the PM. However, with performance data on A&E now published several weeks after events take place, it is less easy to tell how far undoubted signs of real stress in some trusts are a local issue, or are replicated across the rest of the country. Equally, even where national data is available on the state of the service (mainly through winter situation reports or SitReps) this does not necessarily tell us what has caused any problems and there are, in any case, data quality issues with SitReps that should be taken as a caveat on the numbers presented here. First, any current difficulties in the service are not for want of trying. NHS Improvement wrote to all acute trusts in early December confirming a range of actions it wanted the service to make. Not least of these was a stop to inpatient elective work with the aim of bringing bed occupancy rates down to 85 per cent. This is important as many patients who wait in A&E departments are simply waiting for a bed to be available in hospital; by clearing out less urgent cases, the NHS hoped to create space to admit more of these emergency patients as winter set in. 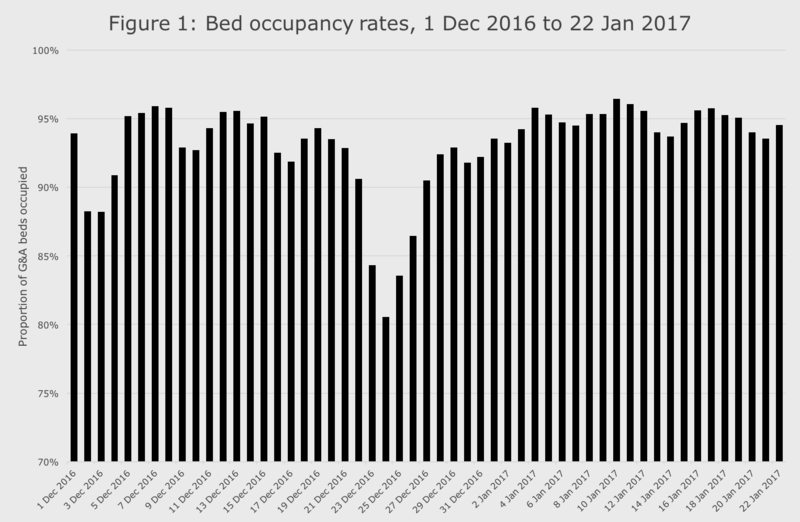 The NHS entered the Winter period with bed occupancy rates already high by historic standards given that they were already at 87.5 per cent in the normally ‘quiet’ second quarter of 2016/17. 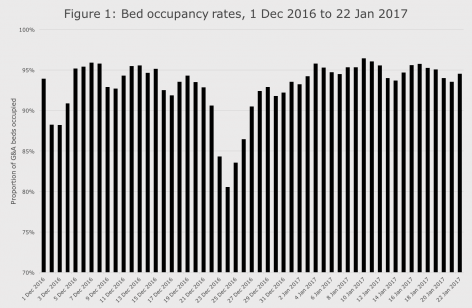 As Figure 1 shows, the NHS did indeed achieve occupancy rates below 85 per cent, but only on 23–25 December when bed occupancy often falls as hospitals discharge as many patients as they can for Christmas. However, whatever spare capacity the NHS managed to create was quickly eaten up. As a consequence it should come as no surprise that early January was an exceptionally difficult time as occupancy rates rose quickly above the 95 per cent mark, although they do appear to have eased somewhat since then. 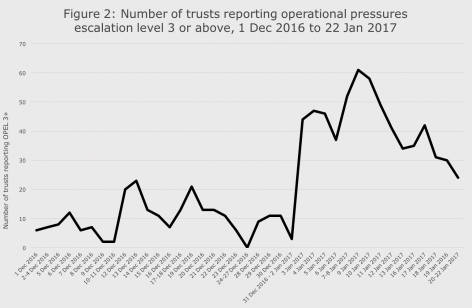 That the service hit real problems after Christmas is also clear from the unprecedented surge in the number of trusts reporting operational pressures. There has been a slight easing of difficulties in the past week or so, although reporting levels are still high. 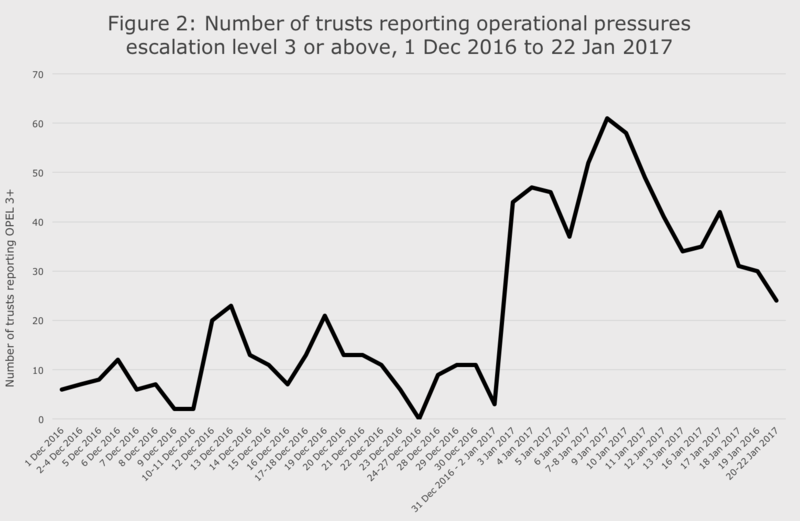 Though the definition of ‘operational pressures’ is very different to last year, there was no such leap in the number of trusts reporting problems in winter 2015/16, when the maximum number reporting pressures at any one time was 19 rather than 61 this year (so far). Almost certainly, increasing admissions and more delayed transfers contributed to this outcome, though as both were rising long before the arrival of winter, neither should have come as much of a surprise. On all of these measures we will need to wait until official statistics on activity are released to really know what happened to demand, as it is either not covered by SitReps (delayed transfers), not comparable to previous years (A&E attendances) or do not get all trusts to report (emergency admissions). The same data release will put actual waiting times in A&E into the public domain, though we can all assume these will be bad. At the same time we will begin to get sight of the impact on routine care that the winter suspensions and cancellations have caused. Could the usual winter suspects – flu, norovirus and cold weather – be behind the current jump in problems? Though a little mixed, weekly reporting on flu levels doesn’t seem to hold an explanation. Nor do beds lost to norovirus seem to be a key driver: at a national level numbers are up a little, but are (generally) holding below 1 per cent of overall beds. Finally, December was mild and despite some colder weather coming through, it has not, for most, been a very cold period. So with the relative (to date) absence of flu, norovirus and snow drifts, where does the explanation lie? Almost certainly in the clash between the steady, year-on-year increase in demand for NHS services and the ongoing need to constrain expenditure and capacity in health care as a result of funding pressures. Cuts in social care have added to this mix by pushing up delayed transfers of care, and may also have contributed to rising numbers of older, frail people arriving at hospital needing admission. With the end of January and February to come, we need to hope that no unpleasant shocks occur in terms of winter bugs or weather, as on current reckoning the NHS has precious little in the way of excess capacity to absorb them. It is only down to the extensive preparation for winter and the hard work and dedication of NHS staff that the impact of the unprecedented pressures facing the NHS this winter has not been worse.